Hollis Line Machine Company, Inc.
Hollis Line Machine Company was started in the early 1960's by John Siergiewicz Sr. Having worked for the areas largest manufacturer of its time, Mr. Siergiewicz began his own business in the barn on the family's 80 acre farm on the town border between Hollis & Amherst N.H., hence the name Hollis Line Machine Company. The family business was joined by John Jr. in the mid 1980's after formal training at The New Hampshire Vocational Technical College in Nashua and learning the trade at various manufacturing companies in the region. The company soon outgrew its location in the barn, and constructed a 18,500 square foot facility on a five acre portion of land on the farm, where the company now operates. 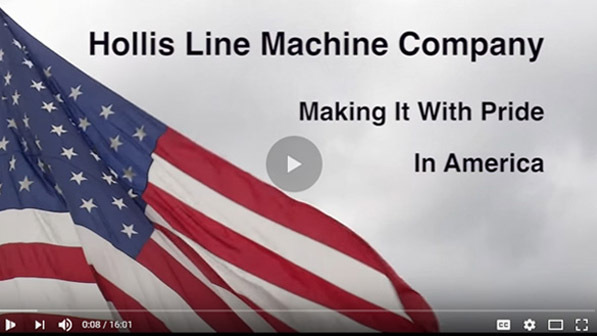 Hollis Line Machine Company specializes in the precision machining and fabrication of Stainless Steel and caters to prototype work from the Research & Development field. Hollis Line Machine Company is authorized to manufacture pressure vessels in accordance with the ASME Boiler and Pressure Vessel Code, Section VIII, Division 1 and holds “U” Certificate of Authorization #32,985. In addition, we hold the National Board “R” Certificate of Authorization # R-5953 for repair and alteration of pressure equipment. Hollis Line Machine Company is ready to fabricate and machine a new chamber, upgrade, or repair an existing chamber. By also manufacturing in compliance to the European Pressure Equipment Directive (PED) (2014/68/EU) Hollis Line can place both a CE and ASME DATA plate on your chamber allowing its sale almost any where in the world. Hollis Line Machine Company is located in southern New Hampshire, just a one hour drive from Vermont, Maine, the seacoast, or even Boston. This strategic location, near Nashua, NH, is located close to Routes 3, 101, and 101A, and is accessible to a multitude of businesses. Copyright © 1997-2017 Hollis Line Machine Company, Inc.